Vidus Vidius, born Guido Guidi, was a medieval Italian surgeon and anatomist. He published a book on surgery, Chirurgia, in 1544, while working in Paris. 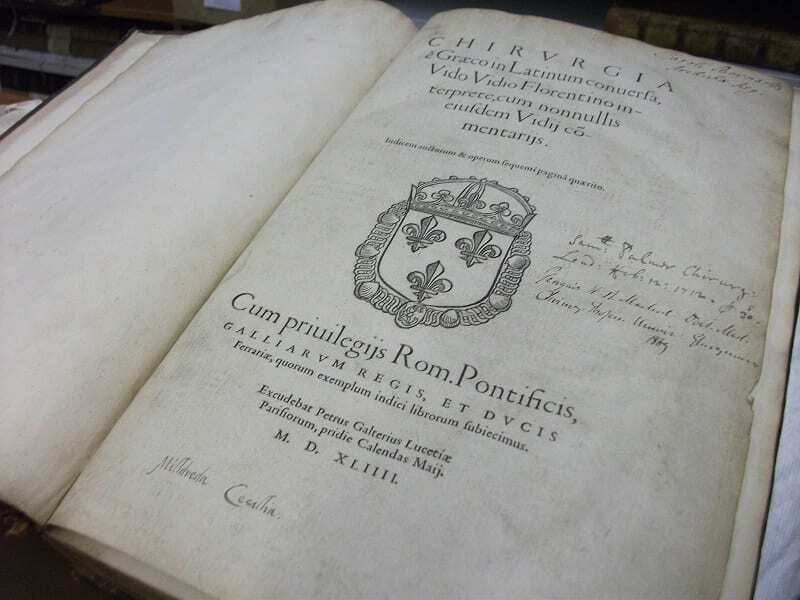 The copy held in the College Library is unusual in respect of four signatures on the title page, indicating previous owners of the book. The first, Caroli Bernardi, Archichir. Reg., is that of Charles Bernard (1652-1710), a surgeon at St Bartholomew’s Hospital in London, who was sergeant-surgeon to Queen Anne from her accession in 1702 until his death in 1710. Five months later, his library was auctioned at the Black Boy Coffee House, and the volume was purchased by William Salmon (1644-1713), whose name also appears on the title page, dated 1712. Salmon was a travelling doctor of dubious qualifications who treated patients privately and sold various medicines and pills. He also built up a large library. He published Synopsis Medicinae, or a Compendium of Astrological, Galenical, and Chymical Physick, which appeared in four editions in the latter years of the seventeenth century. At some point following his death in 1713, the book found its way to Scotland, as the third signature is that of Sir George Husband Baird MacLeod (1828-1892), who succeeded Joseph Lister as Regius Professor of Surgery at the University of Glasgow in 1869, a post he held until his death. The fourth signature is Milldreda Cecillia, and dates from a much earlier period. It has been identified as that of Mildred Cooke, Lady Burghley (1526-1589), wife of William Cecil, Lord Burghley, who was chief advisor to Queen Elizabeth I. She was a notable scholar and translator of classical works, who had a large private library. She was also active in politics, and was said to have exercised considerable influence over her husband, who is regarded as the person who persuaded Elizabeth to sign the death warrant of Mary, Queen of Scots. The book can be consulted in the College Library.